Last week I breathlessly began watching the BBC’s four-part adaptation of Michel Faber’s epic novel, The Crimson Petal and the White. Vintage Shoe Pin Cushion: $20 from Sweet Love Vintage - There's something eerily beautiful about this pin cushion. I'd love to have it on my dressing table with 'To Do' lists secured to it with hatpins, or just to display brooches. I had been concerned that, for want of a better expression, they would bugger it up, and wrote in my last post about the unique type of fear that ripples through you when you discover they’re filming a book you’ve really enjoyed. I know not everyone feels the same, but I happen to think they’ve made a pretty good stab at adapting a novel which mainly consists of richly detailed descriptive passages of narrative – surely a difficult task by anyone’s standards. Let the Light In, photograph: $12 by 3 Lambs Design - This is just stunning, I love the way the photographer has captured the light on the petals of this peony, and the shocking splash of red at the heart of the white petals. In the first episode we spend more time at Mrs Castaway’s house of ill repute, learning about the inhabitants and their various vices. We meet Sugar, just as the narrator introduces us to the cast of characters in the novel, and we know just as surely we’re in the wrong side of town. Burlesque Red Hat: $155 by Order Abandon - People don't wear hats enough these days, do they? I think this is just darling and would make a welcome change to the usual creations one sees at weddings, Ascot and so forth. Great photo, too! In my previous post, I squealed about how gorgeous the pictures of the costumes and sets were; having watched the first two episodes, I’m here to tell you the pictures don’t do them justice. I could gaze for simply ages at the way the sets have been dressed, that overarching Gothic gloom that shrouds both the worlds of the velvet-clad upper classes and the ghastly wretches in tatters. Even the filth and mire of the notorious St. Giles Rookery area of Victorian London is lovingly realised, with the raucous dens of iniquity thrown into sharp relief against the lusciously opulent interiors of the upper echelons of society. In the second episode we see the two worlds colliding, the velvet besmirched as the rot sets in. It’s wonderfully vivid stuff and, despite critics’ fears (hopes?) that it would be wall-to-wall rumpy pumpy; it’s really not that filthy, considering the subject matter and how salaciously titillating it could well have been! Hand Blown Glass Perfume Bottle: $165 by Kiva Ford - There are so many utterly stunning hand blown bottles & glass objects in Kiva Ford's shop that I hardly knew where to begin. This one really caught my eye, though. I think it's those vivd splashes of red against the white background. Sinister and beautiful. I think Romola Garai makes a wonderful Sugar – I especially liked the way she kept her facial expressions entirely free of emotion – except perhaps of sheer boredom – as she, um, welcomed her clients. So to speak. Until she knew they could see her face again, at which point it lit up like an overly decorated Christmas tree. Oriana Ruffled Victorian Shrug: $165 by Countessa - Utterly delectable in every way, this shrug/jacket is just the sort off thing I'd like to have in my own wardrobe. Adore the rich colour and just the right amount of ruffles - pretty without being too frou-frou to wear in reality without feeling like the Sugar Plum Fairy. All of this is nectar to me, as you may imagine, and very inspiring. Even before the first episode, I began building a collection of seedy Victorian items for use in an Etsy Treasury. The layout of that treasury may be seen at the start of this post. Infatuation Antique Repurposed Tintype Necklace: $36 by Luminoddities - Old photographs are always engaging, aren't they? I wonder who this handsome chap was, if he was in love when this picture was taken, if his heart had been broken, or if he was a disreputable cad. Luminoddities has some wonderfully imaginative pieces, I love their style. I hadn’t had time to finish that before posting previously, but it’s now been published (linked above), and I thought I’d share its contents with you here. London Fog Fine Art Photograph: $12 by Keri Bevan - Gorgeously murky colours, here, that sickly yellow and the violet tinging, like a bruised sunset. Pictures from my treasury are scattered throughout this post, or click the link to go to the full-sized treasury list, and browse from there if you prefer. Red Curled Feather Hairclip: $13 by Midnight Boudoir - Release your inner harlot and wear red feathers in your up-do, I say. Make sure a few curls are escaping and that you recently rumpled, or it could look too prissy. And we don't want that. This clip is gloriously decadent - don't just save it for weddings! Anyway, yes. It’s right up my street (or St. Giles alleyway), really, this tickling of the seedy underbelly of Victorian London. A look right up the lacy petticoats at the seething moral dichotomy which Victorian society so loved to wrestle with. Wonderful stuff. 1880's Stranger's Guide to London: $8 from sandp1 - This antique guide looks fascinating, I wonder how many of these places still exist, if any? If you read my previous post on The Crimson Petal and the White adaptation, you will have seen that some people got all hot under the collar, they felt it was “gaudily over-painted” and full of “Victorian Gothic Melodrama” – as though they’re BAD things. Well, anyone who thinks that would put me off obviously hasn’t cast an eye over the rest of this blog, and we doubtless wouldn’t see eye-to-eye. The gaudier and more melodramatic the better, if you ask me! Antique Postcard Couple, by Old Tyme Notions: $3.00 - I have a small collection of hand-coloured vintage photographs, they're fabulously romantic and tacky, but in the good way. Yes, there is "good tacky". I find it rather amusing that sniffy people peering over the tops of their glasses are declaring it rather declassé, and in doing so, have completely and utterly missed the point. The Victorian public adored high Gothic melodrama, and both the book and the television adaptation are tipping the wink to this era in the form of an affectionate pastiche. As for gaudy, well, the Victorians could hardly be called minimalist, and thank the Lord for that. Indeed, you could say it’s the decadence and the “pantomime characters” that serve as an attraction for me, in this austere age of dowdy realism and dull, lifeless, clumsy ‘re-imaginings’ of novels. I dare say that if you loathed the novel, you wont enjoy the BBC adaptation – just as if you detest mandarins, you should probably steer clear of mandarin flavoured sorbet. My advice is: Go for the lemon, old bean! Don’t put yourself through hours of torture on anyone’s behalf. I loathe Hollyoaks. I watched it once and hated it, and decided never to watch it again as it wasn’t at all my thing, but I shouldn’t dream of saying it should be banned, or criticising others for liking it. Red Geranium Petals, dried, by Pleasant Hedges: $6.00 - These would be heavenly scattered over a table as the finishing touch to a decadent dinner party. Or strewn on a bed, as a change from rose petals (yawn), if you like. I have no idea what you lot get up to in your spare time, and prefer to keep it that way. Even the description of these is blowsily romantic: "I grew these flowers in my garden, here on Larkspur Hill, and dried them to be preserved until your special day..." How lovely Larkspur Hill sounds! Let's all don straw hats and eat strawberries whilst running through the fields at Larkspur Hill! It could be an industrial estate for all I know, but it sounds beautiful so I don't care. I am here to tell you that television producers very rarely have my taste in mind when they make programmes. They practically never consult me before spending millions on their latest project. But neither should they, because I do not consider my taste (or lack of) is more or less important than anyone else’s. If I dislike a programme I may give it another go, or I may choose to switch it off and never let it darken my life again. Early Victorian Skate Cape, from Petrune: $750 - Now, there are probably very rare occasions when you could wear an early Victorian skate cape (except perhaps in an early Victorian skating party, of which there are shockingly few), but this is so colourful and jolly, in a sort of toothpaste stripe way, that I just had to include it. I do hope you make a full recovery, dearhearts. Don’t forget to loosen a few stays, put your head between your knees and breathe deeply into a paper bag. If all else fails, have some gin! The Crimson Petal and the White: BBC Adaptation Starts TONIGHT! Michel Faber’s The crimson Petal and the White, ticks so many of my boxes I hardly know where to begin. A richly detailed, viscerally engaging, beguilingly written novel that I fell deeply in love with when it first came out. Of course, ever practical, I got it in hardback and schlomped it around with me like a weighty talisman in the increasingly tattered velvet bag I carried everywhere at the time. The narrative just drips with deliciously rank descriptions of The Great Stink which was Victorian London, the contrast between the perfumed, lace-clad middle classes and the guttersnipes living in utter poverty amidst unthinkable filth of every kind. Just my cup of tea, as regular readers of this blog will readily attest! Watch your step. Keep your wits about you; you will need them. This city I am bringing you to is vast and intricate, and you have not been here before. You may imagine, from other stories you’ve read, that you know it well, but those stories flattered you, welcoming you as a friend, treating you as if you belonged. The truth is that you are an alien from another time and place altogether. When I first caught your eye and you decided to come with me, you were probably thinking you would simply arrive and make yourself at home. Now that you’re actually here, the air is bitterly cold, and you find yourself being led along in complete darkness, stumbling on uneven ground, recognising nothing. Looking left and right, blinking against an icy wind, you realise you have entered an unknown street of unlit houses full of unknown people. And yet you did not choose me blindly. Certain expectations were aroused. Let’s not be coy: you were hoping I would satisfy all the desires you’re too shy to name, or at least show you a good time. Now you hesitate, still holding on to me, but tempted to let me go. When you first picked me up, you didn’t fully appreciate the size of me, nor did you expect I would grip you so tightly, so fast. Sleet stings your cheeks, sharp little spits of it so cold they feel hot, like fiery cinders in the wind. Your ears begin to hurt. But you’ve allowed yourself to be led astray, and it’s too late to turn back now. It’s an ashen hour of night, blackish-grey and almost readable like undisturbed pages of burnt manuscript. You blunder forward into the haze of your own spent breath, still following me. The cobblestones beneath your feet are wet and mucky, the air is frigid and smells of sour spirits and slowly dissolving dung. You hear muffled drunken voices from somewhere nearby, but what little you can understand doesn’t sound like the carefully chosen opening speeches of a grand romantic drama; instead, you find yourself hoping to God that the voices come no closer. The main characters in this story, with whom you want to become intimate, are nowhere near here. They aren’t expecting you; you mean nothing to them. If you think they’re going to get out of their warm beds and travel miles to meet you, you are mistaken. Now I am eagerly awaiting the first in a 4-part BBC adaptation which begins tonight on BBC2 at 9pm. I CAN’T WAIT! Well, I mean I can wait, I suppose, because it’s not going to be shown before then and I doubt the BBC are going to courier a DVD copy over to me, either. The rotters. Romola Garai, Chris O’Dowd, Gillian Anderson, Richard E Grant, Shirley Henderson, Amanda Hale and Mark Gatiss star in a bold four-part adaptation of The Crimson Petal And The White adapted from Michel Faber’s best selling novel by acclaimed playwright and screenwriter Lucinda Coxon and directed by award-winning Marc Munden (The Devil’s Whore, The Mark Of Cain), produced by Origin Pictures for the BBC. As ever, when someone films or in any way adapts a favourite book, one is struck with an initial shivering thrill of excitement. This is followed hot on the heels by that slowly sinking dread that they are absolutely bound to bugger it up. Oh, they are going to RUIN IT for you; and that if they do, you’ll shake your fist at the skies, shouting “Why, God, WHY did you let these incompetent curs loose on my favourite book/film/other thing?” and then you’ll write a letter to the Guardian’s Media section, treating the editor to a frame-by-frame critique, entitled Everything That is Wrong with This Adaptation and including that well-worn line “I cannot believe the BBC have spent MY license fee on this utter drivel”, as though you, alone, fund The BBC and are entitled to personally approve of every single thing they produce. Imagine how scary it must be to have written that novel, and to be watching your ‘baby’ reborn on TV. Luckily, Michel Faber entirely approves and was actually incredibly moved by the adaptation. A few days ago, watching a TV show, I got tears in my eyes. That doesn’t happen very often. For a start, I haven’t watched television for many years, and also, it takes a lot to make me cry. My own private sorrows can make me weep, and occasionally a song can penetrate my defences (June Tabor’s “A Proper Sort of Gardener” does it to me every time), but when it comes to novels or on-screen narratives, I’m tough to crack. Pathos and poignancy are, to me, tactics and techniques; in my work as a writer, I fetch them from my toolbox and use them as required. Show me a tear-jerking movie, and I’ll sit stony-faced, analysing the hell out of it. “Oh yes, this is the bit where they hope people will start sniffling. Not badly done at all, I suppose, for this sort of thing. I’d rate it a 6/10. Maybe even a 7.” Yet a few days ago, sitting in front of the TV, I got choked up… I was anxious what TV would have done to my baby in the BBC’s adaptation, but its new artistic guardians have treated it very well indeed. You can read his reaction in full in the piece he wrote for The Guardian today. 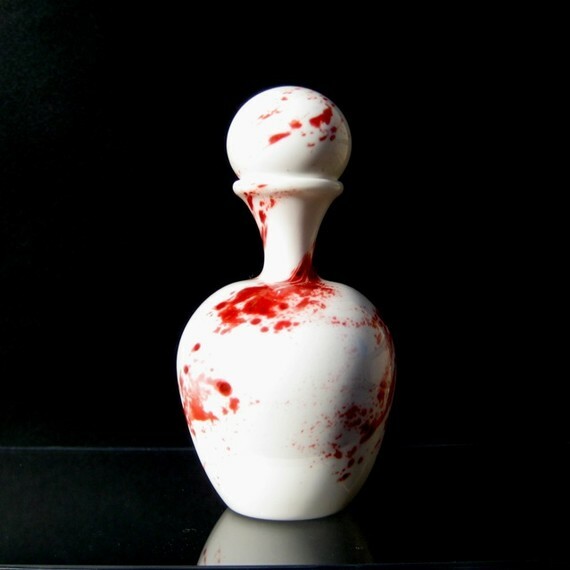 I am currently finalising my choices for an Etsy Treasury inspired by The Crimson Petal and the White (a themed, curated collection of items available at Etsy) and shall hopefully publish this in the next couple of days, after I’ve seen the programme and can let you know what I think of it! Now, must be off as I’m trying to combine cooking Jambalaya, ironing and looking at delicious things on Etsy. I have no shame in admitting that I’m already planning my outfit (and accessories, of course) for a party that’s not due to take place until February next year! This poster is very apt for the occasion and, quite apart from loving letterpress type (being a bit of an old font/type nerd), I heartily condone the sentiment. Also loving the name of their shop! The party in question is not your run-of-the-mill kind, but the third incarnation of Gin & Whores: a semi-regular affair held by Mme Guillotine for various reprobate friends who share her passion for Victorian Ladies of The Night, Gin and Jack the Ripper. Spooky Shades have various items to tempt those seeking unusual lamp shades, but this is one of my favourite. I really like the overlaying of medical illustrations with one of the infamous letters purporting to be from Jack the Ripper. The wonderful Hoolala has been featured a few times on my blog – they do a number of Jack the Ripper themed items, but the one I most covet also happens to be the most expensive. Typical. It’s this luxury pocket watch charm necklace, based on Alan Moore’s brilliant Jack the Ripper graphic novel, From Hell. For now, I have just purchased this necklace (featuring a silver Gin bottle label. HOW could I resist?) in preparation, and now can’t wait for it to arrive. I get terribly excited about this sort of thing. Obviously, this one isn’t available anymore (ha ha), but do have a look at the other pieces in the collection (click on the picture to be whisked to the shop) – there’s a very similar Brandy one. You cannot beat a bit of fingerless mittens action for adding an element of Victorian sauciness to an outfit, and these, by Hypericumfragile are just the ticket. I had to add this saucy greeting card by Coquinette (all the cards are very amusing, using risqué contemporary images and distinctly modern text). Gin & Whores basically involves getting togged-up in Victorian-esque outfits (some guests go for historical accuracy, whilst others opt for modern re-interpretations of Victorian outfits or accessories), drinking Gin and cackling with laughter in locations around London’s seedier locales. This pretty lace-edged, raw silk bolero would be just the thing. Usually we frequent pubs dating from the Victorian period are preferred, those public houses which (in our wildest imaginings) may have served a glass or two to some of Jack the Ripper’s victims, or even [shivers of macabre excitement] Jack himself. That antique Doctor’s bag is just the sort of thing one imagines Jack the Ripper would carry about the place, don’t you think? It possibly sounds a bit odd or mawkish to the casual observer, but we all have enormous fun and it’s all very much tongue-in-cheek. Much like this amusingly saucy Victorian ladies’ fridge magnet, by Pink Burlesque (who are based in Bristol). Really like all their items, actually! In honour of the occasion, and my outfit hunting, I put together this themed collection of various favourites as an Etsy Treasury, I do hope you have enjoyed this sneak peek! An explosion of colours, overwhelming Baroque pastoral scenes involving plump cupids, frolicking 18th century lovers, random Kewpie dolls, 1920’s flapper girls dangling from hot air balloons and, ultimately, a mind-blowing peek into her world of full-on, turned-up-to-eleven romantic historical WHIMSY. A world, as you may imagine, I utterly adore. I can’t quite recall when I first came across her designs, but I know exactly which item it was – a sumptuously gorgeous Victorian style skirt with overlapping romantic scrapbook-like pictures and tumbling roses. Love at first sight! This is a relatively staid design from the current collection, totally wearable – I’d wear it as a day dress with a little cardi, plum colored tights, black biker boots & lashings of pearls. Just beacause. I ALSO completely covet the other design in this style… Dreamy, misty, dusk-like colours and a cameo in the centre of the lacey trellis of a Victorian lady wearing a striped bathing suit. Seriously, what’s not to love? This full-length gown is just jaw-droppingly stunning – I think it looks like something from an Oscar Wilde play. It actually makes my heart beat faster. This design is particularly reminiscent of that Baroque style couture – inspiration surely from cheerfully gaudily painted ceilings and the artwork one finds in those sumptuous palaces that have the power to take the breath away. I love the colours in this skirt, they remind me of hand-tinted romantic Victorian photographs of famous actresses and noted beauties of the age. Born in Kibbutz Naan in 1957, Michal always knew she was an individual with her own vision and this was despite being brought up in an environment that preached group uniformity. She was driven to follow her inner passion for self-expression and spent her childhood designing. Her mother was an inspiration and supported her in fulfilling her dreams despite the Kibbutz’s conventions. Well, there is absolutely nothing that says ‘group uniformity’ in Michal’s designs, that’s for sure. They manage to capture the spirit of those vintage collectible ‘saucy’ postcards – Victorian beauties showing a well-turned ankle or – shocking – gadding about in their under-crackers. A dramatic kimono top featuring Victorian ladies in handcarts above a vast city skyline climbing ladders into the sky… Again, I ask – what’s not to love? It is obvious that Michal is passionate about vintage images, the bejewelled, beribboned world of Baroque, of gilded palaces, the court of Marie Antoinette, intricate Victorian scrapbook pictures, the excess of 1920’s hedonism and those gaily painted barges or gypsy caravans that gleam with brightly painted bouquets of flowers. All passions I share, so no wonder I am so giddy about her work! Little details like the placing of the curtain-call ladies arm-in-arm, circling the cuffs of this beautiful bolero… literally make me squeal. It’s such fun, I love the sheer exuberance of these images and the way they are placed on the designs. Flipping through the glossies reveals pages dripping with lace, leather, blood-red lips and more skull jewellery than you can shake a [skull-topped walking] stick at. Yes, my pretties, it would seem that GOTH IS BACK. It makes me smile, as I used to be a dyed-in-the-wool Gothic Sort myself. I don’t count myself as such nowadays, though I do still hanker after some elements of the style, now and again. There are times when my inner goth still makes their presence known… and y’know what? Seeing some of the editorials infused with such trinkets does still make my heart beat a little faster! I shall split this look up into items I can only, truly, dream about: Wish List; and items I could happily purchase without the bank manager having an apoplectic fit: Shopping List. First, bring on the dreams! Over the Bank Holiday weekend, we were treated to a wonderful two-part adaptation of Terry Pratchett’s Going Postal on Sky 1. I had salivated over the trailers and was not to be disapointed. I LOVED every minute! For those of you who missed it – fear not: it’s being repeated on Friday 4th June at 6pm, or you can watch it on Sky Player online. There will also be a DVD released later this year. The costumes and sets were amazingly detailed and entirely evocative of madcap steampunk Victoriana. Wonderful stuff. Casting seemed spot-on, too, with excellent performances all round. Of course, all this inspired me to create a selection of themed goodies found from various talented designers and sellers on Etsy. Recently, their Treasury section has allowed for one extra item per line, so even more to feast the ol’ peepers on.